I’ve fancied one of these for years. Having sold the 1914 Warrick Motor Carrier at Beaulieu Autojumble, I decided that it was time to become a Mochet owner. Hey, I know it would have been more sensible to pay off a credit card. But you only live once, as they say (though Buddhists say otherwise). I found this lovely original example in deepest France, and my good friend Alain spent 11 hours on the road driving down there to pick it up for me. These are his photos. I like a shiny restored vintage vehicle as much as the next fellow. And I’ve restored plenty in my 30 years dedicated to the vintage vehicle hobby. 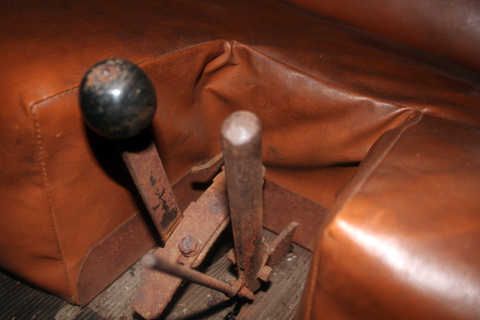 But nothing fires up my heart quite as much as an unrestored ‘oily rag’ in good running order. This Mochet, with its electric starter, is just that. Here’s a pic of the previous owner’s missus giving it some grief (one last time before Alain loads it onto his van). “But this is a bicycle museum” some of you might be saying. “What’s a car doing on these hallowed pages?” Ordinarily, of course, there certainly is an acknowledged gulf between cars and the humble bicycle. But Charles Mochet was no ordinary car manufacturer. He was the pioneer manufacturer of recumbents and velocars. Velo being the French word for bicycle, a velocar really is a bicycle car. This 1956 Mochet is the final Velocar model. Production of the Mochet ceased as a result of a change in French laws which, up until then, had allowed small vehicles under 125cc to be driven without license or registration However, the original Velocar design was essentially two bicycles side by side, without engine, and a wooden body. Mochet’s first cyclecar, for his son George, can be seen below. 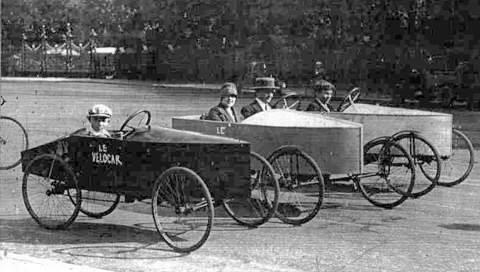 Mochet had been experimenting with Velocars since the 1910s. Velocars sold well to French buyers who could not afford a motor car. The four-wheeled Velocars were fast but they didn’t corner well at high speed, so Mochet experimented with a three-wheel design and then finally settled on a two wheel design – in effect, a recumbent bicycle – to use for speed events. Looking for a way demonstrate the speed of his recumbent bicycle, Charles Mochet’s stroke of genius was to make what was the first performance Recumbent bicycle (‘vélo couché’) using a design based on half of a four-wheeled Velocar. This brilliant machine, called by the factory the ‘Velo-Velocar’, or ‘V-V’ for short, broke many world cycling records in 1933. Mochet convinced cyclist Francis Faure, who was not one of the top cyclists, to ride the two-wheeled Velocar in races. Faure was highly successful, defeating many of Europe’s top cyclists both on the track and in road races, and setting new world records at short distances. Another cyclist, Paul Morand, won the Paris-Limoges race in 1933 on one of Mochet’s recumbents. Then on 7 July 1933 at a Paris velodrome, Faure rode a Velocar 45.055 km (27.9 miles) in one hour, smashing an almost 20-year-old hour record held by Oscar Egg. Since the one hour record was one of the most important in all of cycling, that accomplishment attracted a great deal of attention. Less than two months later, on 29 August 1933, Maurice Richard, riding an upright bicycle, also bettered Egg’s one hour record. When the Union Cycliste Internationale (UCI) met in February, 1934, manufacturers of upright bicycles lobbied to have Faure’s one-hour record declared invalid. On 1 April 1934, the UCI published a new definition of a (racing) bicycle that specified how high the bottom bracket could be above the ground, how far it could be in front of the seat and how close it could be to the front wheel. The new definition effectively banned recumbents from UCI events and guaranteed that upright bicycles would not have to compete against recumbents. For all intents and purposes, the ban is still in effect. Charles Mochet died suddenly in 1934, just after the UCI ban. The business was carried on by his widow and his son Georges. After the war, Georges continued making mainly powered microcars in the ‘Sans Permis’ category until 1957. He also continued to ride and develop recumbent bicycles, and died in 2008. UPDATE 16th October 2009: The Mochet’s arrival in UK.